In order to upload your generated pages, you will need to provide the file transfer (FTP) information supplied to you by your website hosting company. Server Domain or IP Address: Typically this includes a domain address or IP address. If you have a registered domain name for your website, for example, you may supply it here. In some cases you may only have an IP address for the host server. Enter it here. Server Folder: You will normally need to enter the root folder assigned to you by your website server host. Very often this is simply httpdocs, however you will want to check with your website hosting company to be sure. 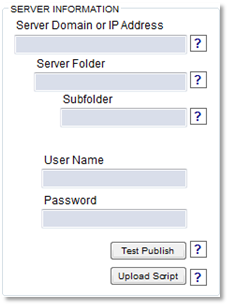 Subfolder: It is a good idea to enter the name of a subfolder, where you wish to have your projects saved. This way, the root folder assigned to you will be kept neat and files you publish will mostly be confined to whichever subfolder you name here. User Name and Password: Enter the user name and passwords that have been supplied to you by your website host company as well. Be very careful to type them exactly as they appear in any correspondence you have received from your website host company. Upload MySQL Script and Test: Finally, in the majority of cases these days, you must upload a script to your website server, making it possible for your website pages to connect to your database. A lot of hosts these days do not allow connecting remotely to their MySQL database. Next, click “Upload Script.” If you have entered the information correctly and all goes well, you will see “The Mysql script file was successfully uploaded.” This only needs to be done each time you use a different subfolder or server, however it won’t hurt anything to do it again. The script should be uploaded to the root of your website as this is where it will be expected so DO NOT upload to a subfolder of the root. Click Next to get to the Database Information screen.